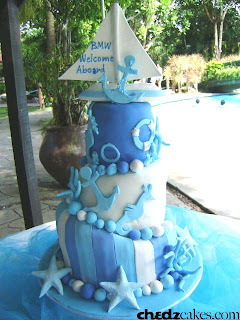 This three layer "topsy-turvy cake" was for baby BMW's christening pool party. The cake was covered in blue and white fondant icing and decorated with gumpaste anchors, floaters, sea horse and star fish. On top is a miniature boat , also made of gumpaste. Welcome Aboard BMW!